For the Family Day Weekend The Spaniard and I invited ourselves to my sister’s cottage at Meridian Beach at Gull Lake, Alberta. 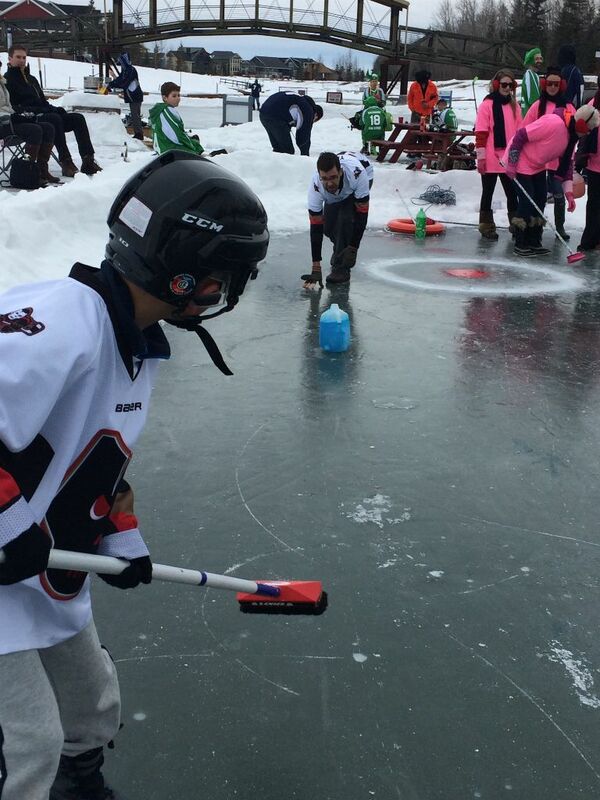 Last Saturday marked the first annual Canal Days – winter edition – which provided an opportunity for The Spaniard to try out something truly Canadian – curling. After a week of warm weather I debated if the ice events could proceed, but on Saturday morning we arrived at the canal to find a flurry of activity. Our first curling game was set for 9:30 a.m. My nephew Kohen arrived with his own curling brooms – not sure how excited he was to have a couple of rookies on the team. I know the Spaniard was expecting to see a set of identical rocks, like on television, but Canal Days offered a more homemade version. Four litre milk jugs had been filled with coloured liquid and rings (or the house) had been painted on haphazardly on the ice. We had a few minutes to practice before our opponents showed up, which gave us enough time to realize a few of the jugs had some wonky curves. We were up against a group of teenage girls who managed to beat us, but they forfeited the game because they had other plans for the afternoon. While the rest of the Yeske family participated in the 3 on 3 hockey tournament, The Spaniard and I snuck off for a tomato and veggie pick up at the Pik-n-Pak, grab some eggs from Brown Eggs and Lamb, and to stop in at Sweet Capone’s Italian Bakery and Cannoli Shop, which happened to be the grand opening day for their new location. We waited patiently in line for about 20 minutes – which gave The Spaniard enough time to decide he wanted to try each cannoli (vanilla custard cream, double chocolate, lemon, strawberry, mocha, toasted coconut, salted caramel, butter pecan) for take away, as well as an almond flower to enjoy with a latte. We raced back to Gull Lake just in time for our 1:30 pm curling match up – a quarter final nail biter which led to us matching up again team Yeske. Kali stuck it out with The Spaniard and I. It was a close one, but sadly our curling day ended in loss to Shawna, Shawn, and Kohen in the semi finals. Thankfully – there were volunteers cooking up hot dogs and smokies so The Spaniard had a consolation prize. Prior to their curling finals – team Yeske had another 3-on-3 game to play. They won that one and then raced back for an epic curling match that had some of the best side line calls, commentary, and cheering I have ever seen. I think the keg located near the curling rink may have had something to do with it. In the end, the game had to go to to an extra end where the pink ladies busted out some killer shots to win the game. The Yeske family followed that game up with another hockey game, winning the family division. Even though we were exhausted, there were still more games to be played. We managed to get in a few games of Ticket to Ride – fuelled by a sugar rush of cannoli and some sweet and salty bacon popcorn I made using a stovetop popper – check out the recipe here. Oh – and of course we made room for some Spanish meat and cheese. The next day we decided to continue on with the small town Alberta theme and pop into Beaumont on our way home from the cottage. It was my second time having brunch at Chartier and I absolutely love it – it was the perfect finish to a Family Day out of the city. Have to thank my big sis for letting us join the Family Day celebration. I’m sure as long we keep picking up cannolis from Sweet Capone’s – we’ll keep get invited back.